Leo Varadkar says Sinn Féin is "the greatest threat to our democracy"
The Fine Gael leadership hopeful added that he wants to “take them on”. 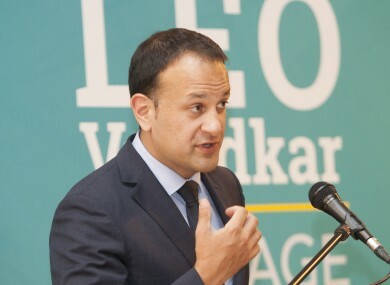 FINE GAEL LEADERSHIP candidate Leo Varadkar has said that, as Taoiseach, he would relish the opportunity to “take on” Sinn Féin and said that the party “is the greatest threat to our democracy”. Varadkar was speaking today at the launch of his plans to take Fine Gael forward, reforming the party and the policies he would offer if elected Taoiseach. He made the comments on Sinn Féin when asked about his intention to make Fine Gael the “United Ireland” party, and if he would seek the party’s help north of the border. No, I’m not putting out an olive branch to Sinn Féin. I think Sinn Féin remains the greatest threat to our democracy and our prosperity as a State. He did, however, concede that Sinn Féin was polling strongly, and this presented as a worry. Varadkar added: “I look at the data and I look at the polls, and I see that Sinn Féin is doing very well with voters over 35. I am very concerned about that. Part of my mission, if I have that opportunity, as leader is to take Sinn Féin on. Reacting to Varadkar’s comments, Sinn Féin’s Mary Lou McDonald said the party enjoyed a substantial democratic mandate from the people of Ireland and urged him to call a general election if he becomes Taoiseach in the next few weeks. McDonald said: “Far from being a threat to democracy, we are in fact an integral part of democratic life of people north and south, making us truly the United Ireland party. Leo Varadkar is a Tory. We will take him and his divisive brand of politics on. When questioned on the issue of white collar crime, in the wake of Seán Fitzpatrick’s acquittal yesterday, Varadkar acknowledged that more needed to be done. “I’m not satisfied our response to white collar crime is robust enough,” he said. Varadkar added that legislation and additional resources would be provided to help tackle white collar crime. His rival for leadership, Simon Coveney, was also on the campaign trail today addressing Fine Gael members in Wicklow. Referring to Varadkar’s united Ireland calls, Coveney told reporters that “last time [he] checked, Fine Gael had been the united Ireland party for many, many decades”. Read: When it’s all over, can Simon and Leo still be friends? Email “Leo Varadkar says Sinn Féin is "the greatest threat to our democracy"”. Feedback on “Leo Varadkar says Sinn Féin is "the greatest threat to our democracy"”.